Pubic speaking Iranian-style is truly a participatory event. We’ve noted before how the speeches of Iran’s President Mahmoud Ahmadinejad can invoke a fiery outburst. Or they can trigger a mass exodus from his audience. And, once in New York, at the United Nations an Ahmadinejad Farsi speech, was incorrectly translated for several minutes. Quite Farcical. But what about an Ali Larijani speech? So this week it’s Mahmoud Ahmadinejad’s great rival, the Speaker of Parliament, Ali Larijani whose speech was curtailed after elements of his audience decided to join in. Speaker Larijani was speaking in Qom, marking the 34th anniversary of the Iranian Revolution in 1979. Ostensibly a solid, serious and all-embracing sort of occasion. And so it proved to be. Speaker Larijani was well into his speech when he was rudely interrupted, Iranian style, by supporters of the President. At first the interruptions to his speech comprised slogans and jeers. But after a while these same supporters of the President took to throwing clay prayer tablets and their shoes. It’s a fact. Audience members throw shoes when they disapprove! The first notable occasion was when President Bush suffered that ignominy during one of his Middle East speeches. And then shoe-throwing protesters upset the Pakistan President speech in Birmingham. But everyone seems to enjoy doing it, so it can’t be that bad. On this occasion, in Qom, they escorted Speaker Larijani away from the podium as the President’s supporters tried to reach him. And that was it…speech over. There’s clearly bad blood between the President and the Speaker. And with the President constitutionally barred from contesting the Presidential elections in June the President’s supporters must see the Speaker as a shoe-in for the job. Hence their unrest. I suspect that Speaker Larijani’s speeches are going to suffer more interruptions in the coming months. Let’s hope it stays relatively peaceful. 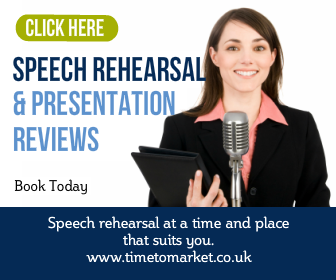 You can enjoy a peaceful public speaking training day with Time to Market. 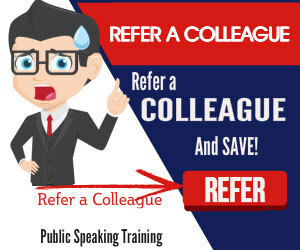 A one-day training course will give you the skills and confidence that you need to be successful as a speaker. Please don’t hesitate to get in touch when the time is right.